Have you ever heard a story of construction workers who died on the job being buried as part of the structure they were building? One of the first stories I heard was of men entombed within the Brooklyn Bridge. Apparently this is a myth, because a decaying body embedded in a concrete structure would then make that structure unstable. However, author David McCullough estimates 27 people were killed in various accidents or safety issues during the bridge construction. I became curious about these myths after I happened across one story recently while researching the upcoming prequel to my historical novel Sharavogue. Call it serendipity, it was one of those magical, unexpected discoveries that make researching history fun, while providing genuine detail to spice up a novel. Centuries ago during construction of the enclosing walls for the town of Bandon, County Cork, Ireland, a young man was killed when a fellow mason working on a scaffold above him accidentally dropped his pickaxe. In the 1800s, the site was being excavated to build a summerhouse. When the workers found a large flagstone that gave a hollow sound when struck, they thought (hoped) they might have discovered an ancient stash of gold coins. Instead they found the skeleton of the poor mason, the pickaxe still under his skull, and his hammer and trowel by his side. In his pocket was a silver coin from the reign of Edward VI. Little remains of this wall today, but stories live on, right? Such as the Hoover Dam, where somewhere between 96 and 112 workers were killed between 1931-36. The myth has it that it was too costly to halt construction when a man was killed and so the concrete pour continued. But if this was true, the structure would not have been able to withstand the pressure of all that water over the years. With the body of water that would become Lake Mead already beginning to swell behind the dam, the final block of concrete was poured and topped off at 726 feet above the canyon floor in 1935. On September 30, a crowd of 20,000 people watched President Franklin Roosevelt commemorate the magnificent structure’s completion. Approximately 5 million barrels of cement and 45 million pounds of reinforcement steel had gone into what was then the tallest dam in the world, its 6.6 million tons of concrete enough to pave a road from San Francisco to New York City. Altogether, some 21,000 workers contributed to its construction. One story where site burials are not a myth is that of the Fort Peck dam site in Montana. Eight workers were caught in a slide there in 1938, but only two bodies were recovered. My curiosity produced many stories of human sacrifice during constructions projects, as well as immurement. One from Germany concerned a mother who sold her son to be interred in the foundations of a castle, and then--feeling rather guilty--she threw herself off a cliff. And a fascinating yet horrifying story is that of the Mole in Algiers, a massive breakwater started in the 16th century by the pirate-king Barbarossa. This structure was intended to provide defense against the Spanish, but the work was constant and relentless, requiring more than 30,000 Christian slaves for labor, and costing the lives of 4,000 slaves, or about five lives per foot of structure. These days, thanks to safety requirements, construction deaths are fewer, workers are paid, and as far as I know are well cared for in case of accidents or deaths. In the US, private industry construction deaths per year are in the hundreds, not thousands. The leading causes of construction deaths are falls, being struck by an object, electrocution, or being caught between things. I'll be visiting Bandon later this year for a little on-the-ground research, and will say a prayer for that poor mason who died there. Until then, keep it safe out there, and follow this blog for stories about my travels in Ireland starting in June, and for notices of when the new book will be out. And in the meantime, embark on an adventure in Irish history! Sharavogue is the award-winning story of a peasant girl who vows to destroy Oliver Cromwell during his march of destruction across Ireland in the 17th century, and her struggle for survival on a West Indies sugar plantation. 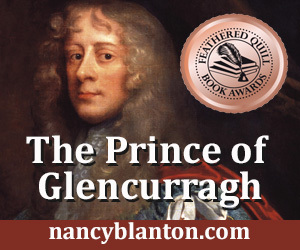 Nancy Blanton is the award-winning author of Sharavogue, a historical novel set in 17th Century Ireland during the time of Oliver Cromwell, and in the West Indies, island of Montserrat, on Irish-owned sugar plantations. She has two more historical novels underway, as well as a non-fiction book about personal branding, Brand Yourself Royally in 8 Simple Steps. She also wrote and illustrated a children's book, The Curious Adventure of Roodle Jones, and co-authored Heaven on the Half Shell, the Story of the Pacific Northwest's Love Affair with the Oyster. Sign up with your email address to receive latest news, event updates, and other important stuff!